A brave man goes up into space. On his fifteenth orbit around the Earth, something goes wrong: a flash of light, a possibly explosion, and the next thing he knows, he’s lying in a hospital bed, trying to explain to his commanding officers how he survived. He has no idea what happened, but at least he’s home again, and safe, back to his loving wife and daughter and the life he knows so well. Except, well, something’s not quite right. There’s a fence around his house where’s there never been a fence before, and the pin on his collar puts his rank at full colonel, which means he either wore the wrong shirt home, or else he was promoted mid-orbit, or else…Something. The wrong details keep adding up. The encyclopedia is full of facts he doesn’t recognize. His daughter thinks he’s an imposter. Even his wife doesn’t know who he is anymore. It’s hard to shake the feeling that we, loyal viewers of The Twilight Zone, have been here before. This isn’t the first episode about a man who goes up into space and comes back to find something’s gone wrong with his life. Really, the whole situation comes perilously close to that old Seinfeld joke, about the Zone “where the guy wakes up, and he’s the same and everybody else is different!” There’s a sense of the familiarity that pervades most of the hour, and even at its best, “The Parallel” never rises to the heights of Serling’s most powerful scripts. The set-up is too expected, the slow discovery of an alternate reality too mundane to register with much intensity. As odd as Robert Gaines’s situation is, once you grasp the fundamentals (which he himself explains about halfway through), there’s no place left to go. He’s in a parallel reality, which is neat, but it’s a parallel reality that’s so close to his reality (and ours) that the changes are negligible. Yet in a way, that makes them oddly affecting. All that’s left is the unshakable unease that comes from life in the uncanny valley: The world is so close to being right that what’s wrong is all the more bizarre. 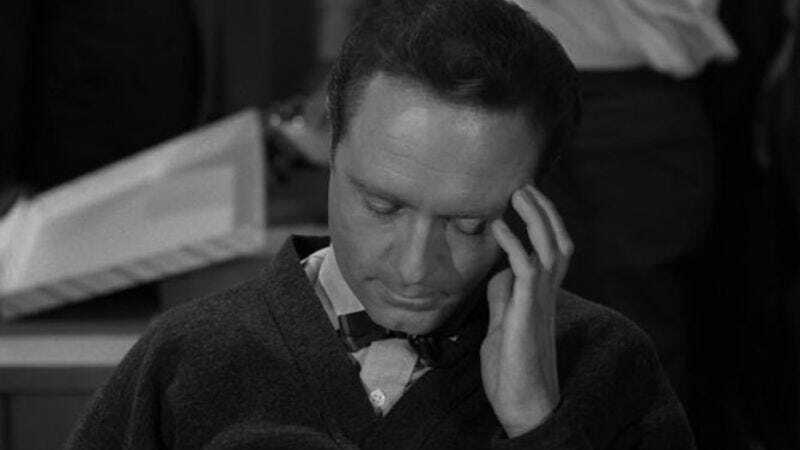 As with so many of the hour long episodes, “The Parallel” actually makes a reasonable case for itself in its first half, and most of the ways Serling chooses to fill out the running time feel like credible world-building, padding or no. The episode starts with Gaines’s wife comforting her daughter about Daddy’s trip into outer space, and it’s unusual enough to be striking that the story begins with characters who aren’t the protagonist. It helps establish a sense of Gaines’s world, a sense that will become critical later in the story; it also helps to ground the space travel element in more practical concerns. There’s a real family he wants to get home to, real people who are worrying about him, so there are stakes when things start to go wrong. Yes, the pace is a little slow, and it’s not perfect. But it’s not a complete trainwreck either. That sense of patience and world-building becomes even more useful once Gaines has his space accident. Or whatever you want to call it. The justifications in The Twilight Zone are usually vague, when they even exist at all, but this one is especially laughable; he’s just orbiting the planet, and then he goes off the radar and falls out of contact with ground control, and then—white space. Followed by a nifty shot of him lying in a darkened room in what turns out to be a hospital. It looks great, but when it comes to making sense? Not so much. The fact that his superiors make a special point of stressing how strange it is that Gaines somehow managed to land his space capsule completely intact just makes it worse. There’s no reason ever given for this, apart from “He’s from a different world,” and there’s no explanation as to how he got from Point A to Point Alpha. Which only becomes a big problem in the episode’s back half, especially the conclusion; but the warning signs are there from the start. Air-tight justifications for the impossible aren’t necessary, but internal consistency is. Still, if you can ignore the clumsiness (and again, that clumsiness doesn’t become truly problematic until the end), there are scenes of interest. In way, “The Parallel” benefits from the slower pacing that has plagued so much of this season, because the added time gives the premise longer to sink in. Gaines picks up the differences piece by piece, and the growing unease of his wife and daughter is allowed room to develop. Both come across as deeply, deeply creeped out by what’s going on, but neither is able to articulate what’s happening. The daughter just looks nervous and refuses to accept this is her father, while Helen, who isn’t allowed the freedom of a kid to simply refuse to accept the situation, keeps acting more and more uncomfortable. (According to The Twilight Zone Companion, there are hints of problems in the bedroom, but they’re buried so deeply that it’s almost impossible to find them.) This isn’t just a quick acknowledgement of distress; because of the episode’s length, we’re given ample time to grasp just how unpleasant this all could be for everyone involved. Well, maybe not everyone; Gaines is frustrated, but his frustration never rises much above “Where are the damn batteries for the remote?” levels. Which ties into one of the hour’s positives and one of its negatives: a lack of clear stakes. Yes, the idea that this Gaines is the wrong man for this world raises concerns—how can he get home? And where is the “real” Robert, the one who knows all about the picket fence and being a full colonel? Yet these stakes never raise above the level of an uneasy curiosity. This is effective in the sense that it’s unusual; for once, we have someone trapped in a situation where something is clearly wrong, and he doesn’t have to spend scene after scene trying to convince everyone around him there’s a problem. The crisis is such an odd one that Gaines’s superiors don’t completely accept his theory as to what’s happening, but there’s still no question that he’s not exactly the same man as he was when he left the planet. At it’s most intriguing moments, “The Parallel” comes close to having a whole group of level-headed, competent people addressing an utterly insane shift in their thinking, and trying to cope with the implications that shift might have. This isn’t a first for The Twilight Zone, but it is unusual enough to be striking: The act of trying to explain the inexplicable can make for great drama, because no matter how many words and theories you pile up to rationalize the issue away, that elephant is still in the living room, flipping through your magazines and floating politely. The downside is, because everybody is working so hard to figure things out, there’s not a lot of suspense. No one’s life is in danger, Gaines doesn’t have to worry about being erased from existence. There are some hints the government is suspicious of Gaines’s story but because those hints never get beyond the “Hmmm” stage, there’s never any danger. Sure, the real threat here is an existential one: Is Gaines just cracking up (no he isn’t), or is he really from another world? 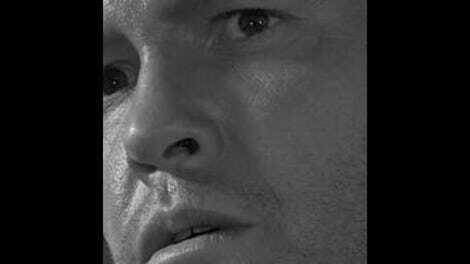 Since there’s yet to be a Twilight Zone episode about a crazy man in a completely realistic universe, there’s never much doubt that Gaines’s displacement is more than just mental, which turns this into a more practical question: how can he get home? In a half hour episode, he might never have returned, but a longer running time means a story that needs to have a back half. And that’s where “The Parallel” completely falls apart. It’s just such a lazy, half-assed way to end things: Gaines is called in to look at the space capsule (which a government scientist has said is similar to but different from the capsule they actually built), and he’s suddenly, and for no apparent reason, thrown back to earlier in the episode when he was orbiting the Earth. There’s the same accident, kind of, only this time, Gaines remains in contact with ground control, and when he winds up back in a hospital room, circumstances have changed. Now he’s back in his own world, and, apart from a brief sign that the other Gaines has popped into this world (before disappearing again, hopefully headed home so it’ll be happy endings all around), that’s it. There’s no reason given for anything, and no deeper thematic resonance to why Gaines experienced what he experienced. Even the closing narration sounds half-assed. (“Submitted to you without any recommendation as to belief or disbelief. You can accept or reject; you pays your money and you takes your choice.” Gosh, thanks.) For a while, Gaines was someplace else, and then he came back, and that’s all there is to tell. The implications are fascinating, but “The Parallel” does nothing with them. Maybe in some other world almost exactly like this one, this story might’ve worked. But not here. What a twist: Robert Gaines winds up in a world close to, but not quite matching, his own. Then he goes home. The “Twilight Zone” has come to have a fairly specific definition over the course of the show’s run: It’s the dusky area between waking and dreams where the impossible can happen as easy as anything. A special place. A magical place. But if the fourth season has taught us anything (and it probably hasn’t), it’s that the “Twilight Zone” also stands for that gray space between great and terrible art. The spot where something isn’t a classic, but where it’s not so abysmal it can be completely dismissed. Earlier seasons have had their good, bad, and ugly entries, but the short run times meant that all but the deadliest of episodes were easy to forget. The indistinct, the unpolished, the under-considered—those passed by quickly, to be mentioned by completists but never thought much of again. But in the fourth season, when every story plays out over twice as much time, and when few of those stories escape the pitfalls of sloppy scripting or bad pacing, that gray space is harder to ignore. Take “I Dream Of Genie,” a not completely awful hour of television that still has me struggling to come up with much to say about it. The premise is a relatively novel one for the series; while we’ve had genies before, this is one of the few times that the majority of the action takes place inside the protagonist’s head with the protagonist’s full knowledge. No sensory deprivation tank of nervous breakdown; just simple contemplation. Sure, there’s an actual genie that prompts George P. Hanley (Howard Morris, easily the best thing about the episode) to go off on his trio of reveries, but those reveries are entirely self-produced. The actual supernatural activity in the story is restricted to two scenes. That’s kind of neat, and while the distinction is in some respects an arbitrary one (the episode is mostly made up of fantasy sequences; the fact that they didn’t actually “happen” matters, but still), it still feels off-format, and at four seasons in, off-format is almost always a good look for any series. But the results are too tedious to be worth a recommendation, and spend too much time getting to the point. Still, as premises go, this isn’t bad. As a self-described “jerk,” George P. Hanley doesn’t have a lot of friends. His co-workers don’t bully him, exactly, but they don’t offer him much respect; the gorgeous secretary (who seems to exist only to be worshipped by the men around her) is polite to him, but not much more. It’s a mediocre existence, and one that contrasts against Charlie’s in “Miniature” in a way that illuminates character; while Charlie’s quiet, gentle oddness suggested a rich interior life, George is just a socially awkward dweeb, doomed to a life of bachelorhood and missing the point. His dog Attila is his only friend in the world, and this being The Twilight Zone, that means something unusual is bound to come along eventually. (Growing up on a diet of popular culture can give you the mistaken impression that being lonely and sad is the surest route to an occult experience.) In this case, it’s arrives in the form of a magic lamp. Charlie bought it as a gift to give to the aforementioned secretary, but winds up taking it home instead, where he rubs it, and a gruff, cynical genie with a sport coat and cigar pops out. The genie tells him he has one wish; he better use it wisely. Usually, stories like this are all about twerps leaping in with both feet without bothering to think through the consequences. So there’s something refreshing in what happens next: George tries to decide what he could wish for, and then, when he narrows down his options, he actually considers what each one might mean. In the same way that Robert Gaines’s misadventures made room for everyone around him to be concerned, there’s something almost revolutionary about this. It almost threatens to undo the show. A lot of what happens in The Twilight Zone depends on characters not being self-aware enough to worry about what comes next. Instead of stumbling forward and falling headlong into a comeuppance, George carefully (and exhaustively) figures out the ironic twists ahead of time. It’s refreshing in theory, because by now, the expectation is that any wish-granting genie, no matter how gruffly well-meaning, is bound to create trouble. By trying to head off trouble before it arrives, and doing so in a thoughtful, patient way, George makes himself distinct, and it’s that much easier to root for him to figure things out. Unfortunately, this is also a low-stakes approach to the problem, given that none of the fantasies have any fallout in real life. Worse, the outcome of all three is so telegraphed that there’s not much suspense in seeing how each new “wish” will fail. George wonders what it would be like if he was married to the secretary, and that she was a famous actress; but since she’s clearly not interested in him, and since Hollywood is a decadent bacchanal of moral depravity, that’s not going to work out for a happy ending. George wonders what if would be like if he was rich, but money can’t make you happy. George wonders what it would be like to be President, but the responsibility is too much to handle. Each fantasy takes too long to play out (the “Hollywood” one especially; it’s like watching a whole other episode), and the conclusions are always the most obvious, banal ones. While moments within each section are entertaining (especially the last), they never play as hugely necessary. And when George finally decides to use his wish to become the genie of the lamp himself, the decision still feels somewhat arbitrary even after all that justification. Some of George’s process is there, but the result feels extreme. So, “I Dream Of Genie” is mostly a slog, too repetitive and sluggish to be effective as a comedy, and not thrilling or illuminating enough to work as a drama. It’s fundamentally pleasant, at least, and Howard Morris almost manages to hold everything together. The undercurrent of all three fantasies is that George is trying to wish himself into being a different person (which is why his dog becomes a different breed each time), with inevitably unsatisfying results; Morris uses this as an excuse to take on different mannerisms in each version, and his work is thorough and subtle enough to be effective. But it’s in service of a fundamentally shallow script (by John Furia, Jr.) that lacks the philosophical depth needed to make this watchable. In half hour form, it would’ve been cute, but forgettable. As is, it’s just forgettable. What a twist: After realizing that none of the standard wishes (love, wealth, power) aren’t going to make him happy, George decides to become a genie himself. And he brings his dog with him. George buys the lamp because it’s the secretary’s birthday. The other guys in the office all pitch in to buy her a nightgown. Yowza. Oh, and the boss buys her flowers, too. You got your sexual harassment seminar mixed with my genre show! The secretary (Patricia Barry, who had a similar role in "The Chaser"), the douchebag co-worker, and the boss all play roles in George’s visions, which is fine. The whole thing feels a bit like the Peter Cook/Dudley Moore film Bedazzled, only it doesn’t have Peter Cook’s marvelous Lucifer (Jack Albertson is a low-key genie; besides, he only appears in a single scene), and it’s not nearly as funny.